Conservation Framing: What is this & why? 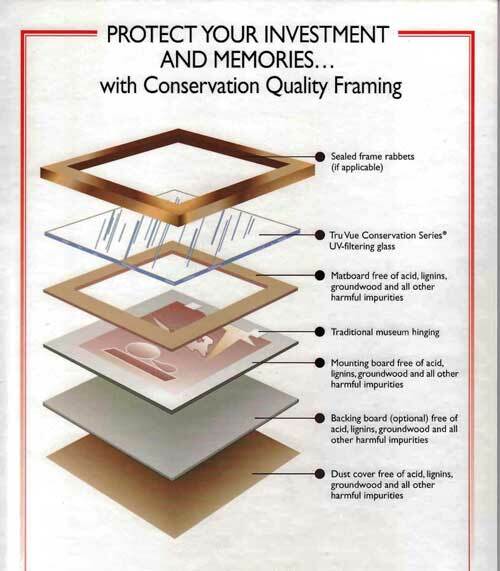 Conservation framing involves specialised materials that filter U.V light & are acid free, which minimise decay & encourage longevity of a framed work. Standard matt boards & backing boards contain acids which over time can migrate into the framed work, slowly deteriorating it as the chemicals react & the mat boards themselves also degrade and fade. Conservation aat boards are acid free & more stable to light exposure. The bevelled cut will stay free from the yellowing which occurs with standard mat boards. Acid free backing boards & acid free tapes are also used. Full conservation framing includes 98% U.V filter glass as well: The manufacturers claim U.V glass inhibits 98% of UV rays permeating behind the glass nevertheless it’s recommended a framed work is kept out of direct sunlight for optimal longevity. Conservation framing is a recommendable option for original art works, limited edition prints, treasured photos & specialised framing types like tapestries and memorabilia.